In this post we are going to learn ajax live search or make autocomplete textbox by using JQuery in Laravel Application. Here we will make simple and good example of How to create Autocomplete textbox in Ajax JQuery using Laravel. We will use ajax request for getting records from Mysql database table. In tutorial we have build autocomplete functionality in Laravel by using Ajax with Jquery and Mysql database. 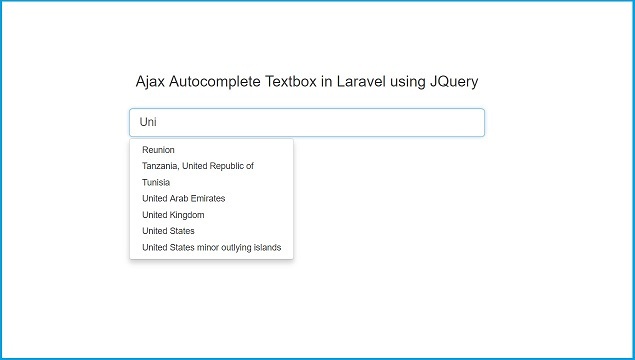 For learn Ajax Autocomplete textbox in Laravel we have use simple country search example. In Mysql table we have already inserted all countries name. So, From Laravel application when use has start to type any country name then it will send trigger ajax request to Laravel method for search and get list of country which start with character which has type in textbox by user. And user will get list of country name suggestion below textbox and he can select particular country from list of country. This is main benifites of Autocomplete feature in our web application, we do want to type whole name but we can simply select from list of suggestion. So, in this post we have make ajax autocomplete textbox in laravel by using JQuery and Mysql database. Below you can find complete step by step process for developed autocomplete textbox feature in Laravel by using Ajax, JQuery and Mysql Database. First we have to make apps_countries table in our mysql database. We will fetch country data from this table and display in autocomplete country list below textbox. After this we want to make one Autocomplete controller for handle http request for Autocomplete textbox. For this we have to write this following command in command prompt. Above command will make AutocompleteController.php file in app/Http/Controllers folder. In this file we will write following code. First index() method will html output on web page and dislay textbox for enter country name. When we have enter country name then it will send request to fetch() method for search country name from mysql table. Now we want to make view file with name autocomplete.blade.php in resources/view/ folder. This is our output file and we can see output in browser. In this file we have write html code for display textbox for enter country name and jquery code for send ajax request to Laravel Autocomplete controller fetch() method. After fetching data from server it will display list of suggested country below textbox. This is last step of our tutrial and here we want to set route of AutocompleteController.php index() and fetch() method. For this we have to go to routes/web.php and write following code for set route for this two method. This is complete step by step process for implement Ajax Autocomplete textbox feature in Laravel Application using JQuery with Mysql database. If you have query regarding this tutorial, please comment in comment box. I need do this for 2 inputs in the same page, but onclick event complete the 2 inputs in the same time. What can I do?